Choosing to start in Chiang Mai, Thailand was fortuitous. It really is very convenient for digital nomads. Monthly renting is easy in Chiang Mai. Lots of great food and co-work spaces options. Good internet all over. It is an easy and enjoyable place to live. Maybe I missed it but one very small mis-step was not packing a towel. I don’t recall that on the list of things to bring but there hasn’t been a towel at three of my stays, including Chiang Mai. Small missteps are the best ones. I started my digital nomad ways a bit differently than most (though largely in similar ways). I lived in Malaysia a couple years first and then set off to be a nomad. I just sent two boxes a bit bigger than those for a ream of paper back home before I left. And I gave a bunch of stuff away I had picked up (books, printer, basketball, plants, cloths, etc.). But I decided just to start the nomad life with my large suitcase, carry on sized suitcase and my small backpack. Those suitcases have been fine for my travels so far. But I have done what is probably sensible and create a much better system for packing. I don’t normally leave stuff behind but so far I have left behind; the electric cord for my shaver, two hats, 2 socks (not matching so I know have 3 socks of 2 types) and something else that I can’t remember right now. I also spend way more time looking for stuff than I should. I think I would be wise to create content pouches that then go in specific places so I know where to find stuff. I do that in a half-hearted way now that works in general but those few items that fall in can waste a bunch of time. I have a house for this stay and room to fully unpack and arrange things, so hopefully I will be in a bit better shape after this stint in Vietnam. 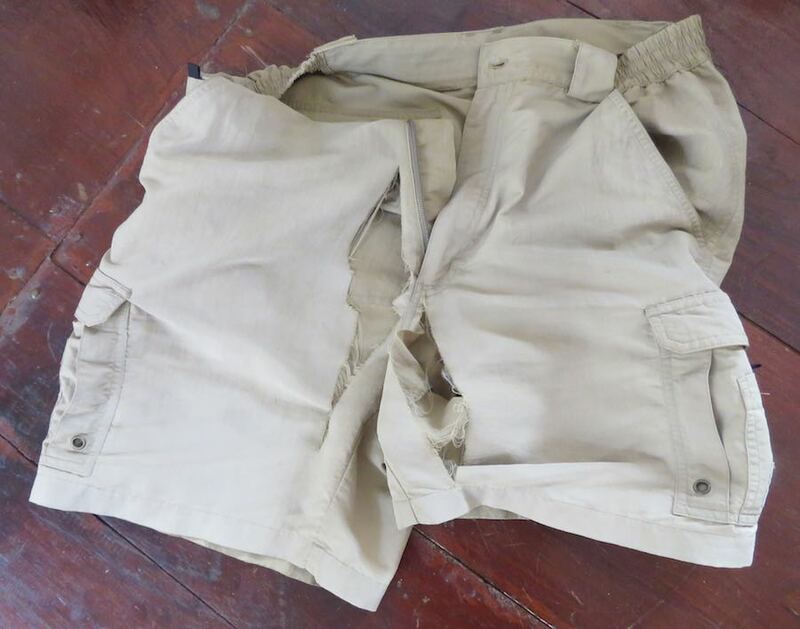 I also managed to rip a pair of my shorts pretty spectacularly on a hike. I managed to get home ok, my uncool belly-pack hid the ludicrous tears to some degree. Luckily for me as part of my packing up I took a couple extra pieces of clothing, so I didn’t need to replace the shorts. I have extra cloths I don’t really need and probably wouldn’t take if I go the large backpack route when I relaunch as a nomad next time (which I think is what I will do, and also take my current backpack). Large tears made while I did the wonderful Chompet hike across the river from Luang Prabang. I also brought along a good spoon, fork and knife which I have found useful and I don’t remember people talking about. And I bought a microwavable tupperware container – also useful. These things take up very little room it seems to me. I also have a swiss army knife which I mainly find useful for the scissors but other things occasionally. Again it is very useful. 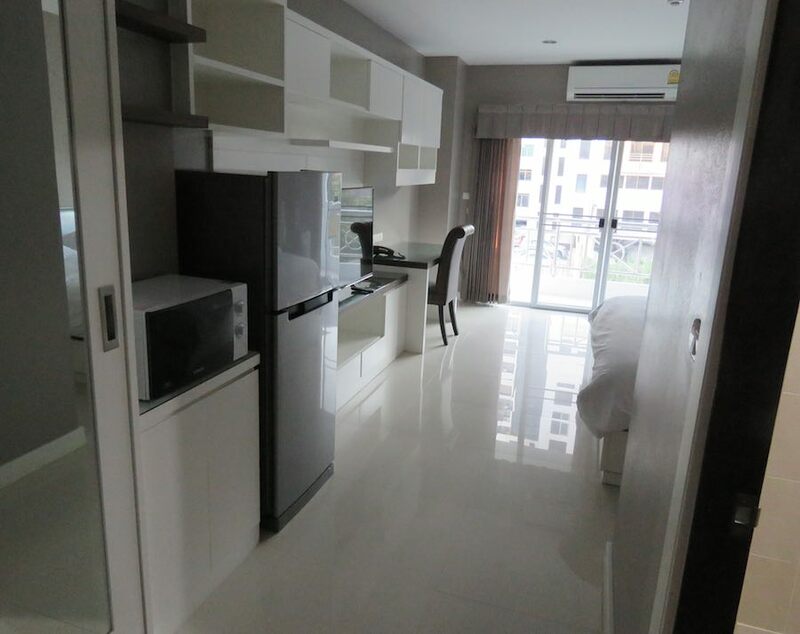 Very nice studio apartment in many way. The sound proofing between the rooms was awful (sound proofing for outside was good). I was woken up by Skype calls at 2 AM from next door, after more than 15 minutes I go and say I want to sleep and the guy says “what do you want me to do, I need to make calls.” Pretty much a killer failure if you can’t sleep in your apartment. For those with larger feet you may well have trouble finding shoes, I have had trouble finding large enough (size 11-12 USA) shoes. Also practice becoming a neat eater before you leave, your napkin is often flimsy and tiny and if you are given any you will be given one.